In a 2011 blog post asking for feedback on the planning of our first customer survey, we were put onto the net promoter system as a way of getting feedback from customers. 2. Customers who have emailed with our Customer Happiness team have a similar question emailed to them a couple of days after their interaction with us. 3. Customers who have shoes delivered to them receive a similar question emailed to them a week after receiving their shoes. We're thrilled to be getting such high scores. 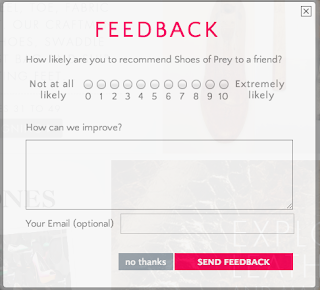 83% of customers who purchase from us and respond to the survey are promoters scoring us a 9 or 10 out of 10 on how likely they are to tell their friends about Shoes of Prey, and only 2% are scoring us 0-6. Subtracting 2 from 83 gives us our net promoter score of 81 for customers who purchase from us. A middle of the road score is 0, as many promoters as detractors. 50 is considered an excellent score. Still, we can improve and what's most valuable for us from this is not to rest on our laurels at our high score, it's to close the feedback loop and action the feedback from our customers on what we can improve. If the customer was happy to provide an email address (we've blurred them out above) the Customer Happiness team follows up on the written feedback directly with the customer. Beyond that, it's been an amazing tool for getting a feel for what improvements our customers would like us to make. 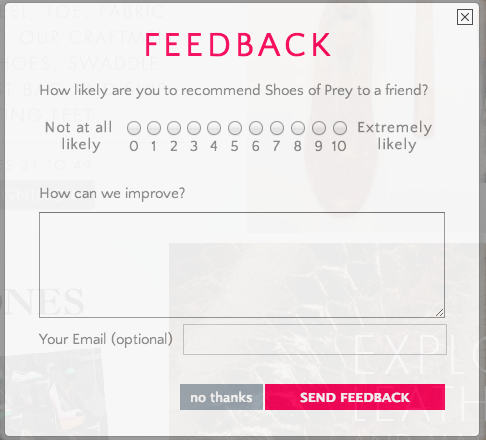 As a predominantly online retail business we don't have the same level of interaction with our customers that an offline retailer would, so implementing this net promoter questionnaire has been a great way to get more detailed customer feedback. I read the emails thoroughly every day, as do the rest of our management and Customer Happiness teams and if there are specific pieces of feedback we think we should action as a business, we'll often discuss this in the email thread. So far we've made significant product and price changes that were both driven by the feedback we were receiving from customers, and we've been able to monitor movements in our net promoter scores after making the changes to gauge whether they've been effective. We'll be continuing to do this and can recommend it to others. Do you have a net promoter based system implemented in your business? If so has it been helpful and what learnings have you taken from it? Hey Michael, thanks for sharing, as always. In addition to NPS, you might want to consider including other measures to get a more rounded view of what your customers think. Ideally, you'd also include Customer Effort (how easy was it to design and order your shoes?) and Customer Satisfaction (how satisfied are you with your new shoes/buying experience?) scores as well. Great post Michael! I really like your daily summary email, means you are able to 'converse' with customers daily, which as you mentioned is not always easy in the online world. I have had a look around but can not find the pricing / installation steps for NPS. Just wondering if you can point me in the right direction? Hi Toby, we built our own integration of it so I've not seen any pricing, though when I heard the guy who developed it present a few years back he said they were building something people could easily integrate - I haven't looked to see if that happened though. Best of luck. Ah right, just been looking into it some more now and realise I did not understand how it worked in full. Will get going on our own integration in the coming weeks. Thanks for the help Michael! Finally I bought a pair of shoes for my wife and it was followed by the NPS survey. Can you share with us which software did you use to integrate the survey into your email? We are looking at various options for ourselves right now. Hi Gary, I hope your wife loved her shoes! As with the rest of our NPS implementation, we built the code to integrate the NPS survey into the email ourselves rather than using an off the shelf product. The daily NPS survey has been awesome for our business, I'd highly recommend it.